Top Rent A Car is the largest independent car rental company in Bulgaria. The company has grown to a size of more than 800 vehicles since its founding in 2003. (left to right) Viktor Genovski, operations manager, Angel Iliev, customer relations, and Angel Angelov, rental agent. Founded in 2003 by Milen Marinov with a fleet of 20 vehicles serving the summer resort town of Varna, Top Rent A Car has grown to be the largest in Bulgaria with a peak fleet of more than 800 cars. Top Rent A Car has locations serving the Sofia Airport, the Black Sea resorts and the rest of Bulgaria, as well as the Balkan airports in Turkey, Greece and Romania. In a Q&A with Auto Rental News, Stanchev talks about Top Rent A Car’s growth and competition, the Bulgarian car rental market and the challenges of operating a business in Southeast Europe. Q. What are your primary sources of rental customers? A. We rely on our online presence as our main customer source. Of course, it’s very important for us to get business from global reservation systems, global distribution systems, tour operators, travel agencies and local businesses. Q. What new business sources are you developing? A. Today we are working successfully with a wide range of businesses such as hotel chains, tour operators, travel agencies, real estate agencies and more. We never stop pursuing new partnerships, mainly online-based companies and local businesses. Along with car rental, we are developing additional services such as operating leases and car sales. Q. 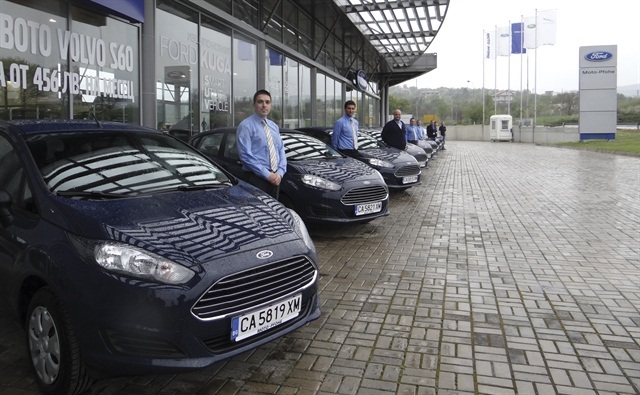 How has the car rental market in Bulgaria evolved in the past 10 to 20 years? A. The car rental market has seen rapid growth in the last 10 years due to the growing number of incoming tourists every year in Bulgaria. There was no car rental business 20 years ago. In recent years the competition became more severe due to the recession. Q. How did you survive the recession? A. We survived by lowering our prices and giving more benefits to our customers than our competitors. We paid more attention to customer service and customer satisfaction. Q. Describe your affiliation with Payless, including how it is benefiting your company? A. We are proud to be an exclusive partner of Payless for Bulgaria and to provide car rental services to all Payless customers visiting Bulgaria. Payless is a good way for us to be part of the U.S. market even though there are not a lot of American travelers in Bulgaria. It’s been several years of a successful partnership and we are striving to continue the good affiliation. Q. What method do you use to acquire cars? A. Most of our car fleet consists of new cars bought in the past two to three years. We are negotiating with manufacturers and official dealers so we can give the best price for our large corporate clients, who buy cars for their businesses. Q. What are your popular rental vehicles? A. In our fleet we use a wide variety of models and classes from brands such as Ford, Renault, Nissan, Chevrolet and Toyota. 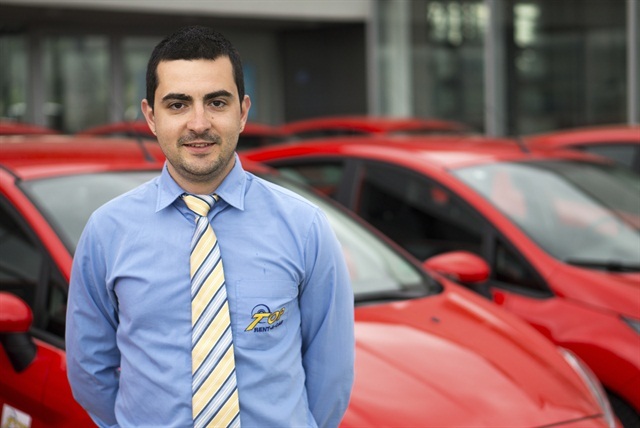 George Penchev is Top Rent A Car’s sales representative for the Eastern region. Q. How long do you keep cars in fleet? A. Most of our cars are new models. We keep a small percentage of our fleet (SUVs and nine-seat passenger vans) for more than three years. Those vehicles are more expensive but are also designed to run higher mileage. We renew the most popular vehicles in the economy and compact classes almost every season. Q. How do you dispose of your de-fleeted cars? A. We sell cars through our used car lots. We also sell cars online and to other businesses. Because of good fleet maintenance, our corporate clients buy used cars for their businesses. Q. What are your biggest challenges with the fleet? A. Generally, it is a challenge every year to purchase the right number of large vehicles, because the demand of these vehicles is different every year. Q. What types of counter products are popular? A. GPS devices, child/baby seats and boosters, snow chains, cell phones and new products such as 3G wireless routers are popular. Q. What other car rental brands compete in your marketplace? A. We compete with the international brands mostly online and at the airport locations. These companies have huge resources because of their global incomes, so we count on other advantages such as better knowing the market, added value to the customers and flexibility in decision making. We take a personal approach to every customer, which makes the provided service exceptional and gives us an advantage over other local and international companies. Q. What does the car rental market in Bulgaria look like? A. It’s the 10/90 rule — about 10 car rental companies (we’re one) serve 90% of the market. There are a lot of small, local companies and a big rivalry among the main players. The small companies are more like family businesses, operating in one location with a fleet of five to 15 cars. The problem is that such companies can’t keep their cars up-to-date and in good mechanical condition; therefore a lot of customers are disappointed with the service they provide. This makes it harder to persuade customers that we are a company they can rely on. Q. How do you market or advertise your business? A. We put a lot of effort into online advertising using search engine marketing, social media marketing, email marketing, business listings and more. Along with online marketing, we pay attention to print advertising and outdoor advertising with billboards in main cities and resorts, as well as face-to-face communication and a lot of meetings with new partners. Q. What are your biggest business challenges right now? A. Our biggest challenge right now is to keep all the cars busy year-round. It’s very difficult due to the short seasons. We have about two-and-a-half months of high summer season, two months of winter season and a short spring season too, surrounding the Easter Holiday. We relocate part of the fleet between our summer and winter offices during the year. The main legal problem is the huge number of speeding tickets caught by speed cameras on the roads of Bulgaria and the complicated legal procedure surrounding this. We hope the government will take care of that soon. Other problems involve how insurance companies handle accidents with our cars and customers stealing our cars. (There are a few theft cases per year, mostly done by foreign customers). Q. Are there any new laws or rules that affect the business? A. A law was introduced this year mandating that all businesses connect their cash registers with the National Revenue Agency’s system. This is actually good for us because small local companies are trying to cheat the law by not giving accurate data of their revenue to the government. Q. Do you see consolidation of car rental companies in your market? A. The local car rental market in Bulgaria is small compared to markets in other countries such as Germany, Spain or Italy. In Bulgaria, the market is distributed between international companies, a few national companies such as Top Rent A Car and many small local companies operating in cities or resorts. Except for our company, there are no other independent, founded-in-Bulgaria car rental companies with a well-developed network of offices, partners and organization that would evoke the interest of the international majors to purchase. Q. How does the broker model, which is prevalent in Europe but not in U.S., affect your business? A. A difference between car rental in the U.S. and Europe involves the commission model. Commissions in the U.S. are fixed. This gives car rental companies the ability to compare and compete better with their rivals without worrying about the final price on broker websites. In Europe, the major brokers (controlling 90% of the market) work with a variable commission based on the net prices that car rental companies give them. This model gives flexibility to the brokers to offer any price they want but gives a smaller profit for the car rental companies, who are pushed to always provide lower prices — without having a clue as to the final price on the broker’s website. 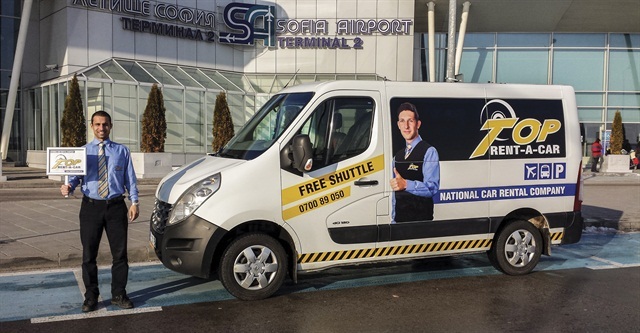 Top Rent A Car’s free shuttle service operates at Bulgaria’s Sofia Airport. Deyan Radev is pictured at Terminal 2. Q. In general, what are the major trends for car rental in your region today? A. For the last year the major trend has been the growing number of online pre-bookings versus the drop of direct local rentals and traditional bookings by phone. This trend is also driven by the huge expansion of mobile device usage and the growth of online advertising among brokers and car rental companies. This trend will continue. Forecasts predict that by 2016 online advertising will outpace traditional media, giving an even higher share for online bookings. Another trend in the region is the growing number of “unorganized” tourists coming for a holiday. Traditionally, most of the tourists to the region come through all-inclusive packages with organized transfers from the airport and planned excursions during the stay. Tourists without pre-booked travel are increasing, and more and more people want to explore the region on holiday. Q. How do the region’s politics affect the car rental business? A. From a political perspective, the main issue in our region is the crisis between Russia and the Ukraine, which is affecting different sectors of European countries’ economies, but most of all, affecting outgoing tourism in these two countries. There is a drastic drop in Ukrainian tourists visiting Bulgaria and other countries in the region such as Greece and Turkey. There is a significant drop in bookings from Russia due to the record high exchange rate of the dollar. Besides the economic constraints, other factors affecting travel are the ban imposed by the Russian government for public officials to vacation abroad. The authorities in Moscow also banned children, seniors and veterans from taking state-subsidized holidays in Bulgaria. Considering that the major share of tourists in Bulgaria and the region come from Russia, the above measures will have a serious impact on the car rental market in 2015. Q. Any thoughts on how the economy is affecting rental? A. The economy has a direct impact on the car rental market. The Ukraine/Russia conflict lead to drop in the outgoing tourist flows from these countries. This impact is huge, considering that Russia is the world’s fifth largest outbound market and most important tourist market in the region. The drop in fuel prices has had a significant impact on tourism and car rental in countries that import and export oil. This has already impacted the record high dollar exchange rate, which lead to the increase in U.S. tourist bookings in the region, coming mostly in Greece and Turkey. Q. What does the pricing environment look like? A. The competition between big brokers and the forecast for a decrease in demand pushed rates to new lower levels compared to 2014. The striking contrast in demand during summer and winter seasons led to prices as low as $2 a day in Spain and $6 a day in the local market off season. This summer we expect lower rates compared to last year.